Young’s Foodservice is delighted to unveil an iconic and bold new logo for their King Frost brand. With over 50 years of experience in developing products specifically for fish friers, King Frost is the number one fish cake brand within the fish fryer industry. The new logo has been designed to achieve a more modern and visual identity for the brand, while reflecting its proud British heritage. The new design features a bold colour scheme of red, blue and white reflecting the Union Jack, which is also included as the backdrop for the logo. 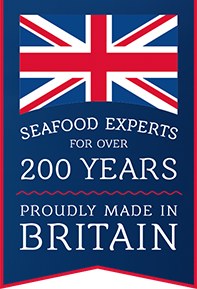 This exciting new rebrand comes at a time when Young’s Foodservice has joined the Made in Britain organisation which allows them to use the esteemed ‘Made in Britain’ marque on relevant material. Designed to help consumers quickly and easily recognise British-made products, the ‘Made in Britain’ marque is accredited to businesses that make and sell goods which have been manufactured or have undergone a final substantial change in Great Britain before going on the market. This has helped to inspire the ‘Proudly Made in Britain’ tag line on the King Frost logo, and enhances the message that King Frost communicates as a brand.